The municipality of Frankfort administers a General Assistance program for the support of the poor. Pursuant to Title 22 MRSA 4305, the municipal officers have adopted an ordinance establishing that program. A copy of this ordinance is available for public inspection at the Town Office. 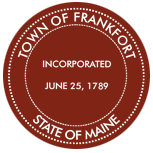 Also available for inspection is a copy of the State’s General Assistance statuettes, as copies of the State law are made available to the municipality by the Maine Department of Human Services. Persons who wish to apply for General Assistance may do so at the Frankfort Town Office. In an emergency, applicants may contact Evelyn Adams at 223-4602, Steven Imondi at 223-5995 or Vaughan Littlefield at 735-8173. To view or print a copy of the application, click here. The municipality’s General Assistance administrator must issue a written decision regarding eligibility to all applicants within 24 hours of receiving an application. The Department of Human Services toll-free number, to call with a question regarding the General Assistance Program, is 800-442-6003. This notice is posted pursuant to Title 22 MRSA 4304-4305.